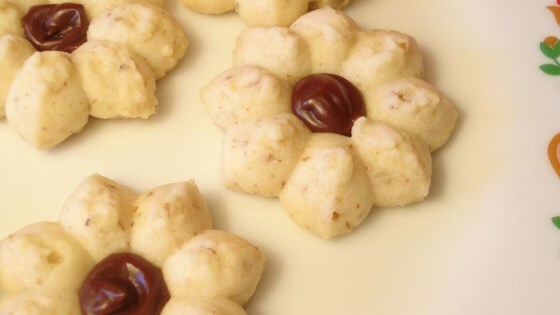 "These are a delicate nutty butter cookie with a chocolate filled center. My aunt used to make these, and I loved them." Preheat oven to 400 degrees F (200 degrees C). Grease cookie sheets. In a medium bowl, cream the butter, margarine and confectioners' sugar until light and fluffy. Stir in the vanilla. Add the flour and mix until just blended. Do not overmix. Roll dough into 1 inch balls. Place cookies 2 inches apart into prepared cookie sheets. Make a slight indentation in the center. Bake for 10 to 12 minutes in the preheated oven. Cookies should be lightly browned. Cool slightly and frost the center of each cookie. To make the icing, combine the confectioners' sugar, cocoa and vanilla in a small bowl. Stir in the hot water 1 tablespoon at a time until desired consistency is reached. Drizzle the icing from the tip of a knife or spoon onto the center of each cookie. Allow the cookies time to set up before serving. The recipe doesn't say to add the nuts, salt, and baking powder in at any time so I added it when I added the flour. They ended up quite good and very addicting, as my mother found out! The cookie is good , however the icing needs butter. It was very easy to make. The only thing a child shouldn't do is chop the nuts.